Reintroduction of unity between church and state. 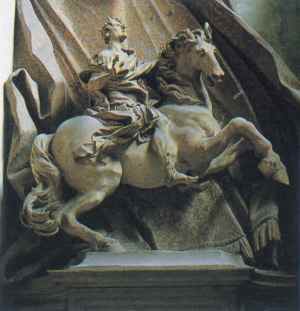 Statue of "The Vision of Constantine" (A.D. 312) in St. Peter's Basilica. 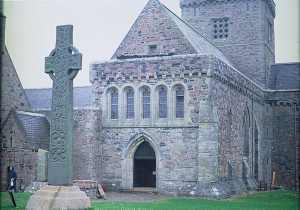 Iona Abbey: Built on the site of the old monastic school established by the missionary Columba in 536 A.D. 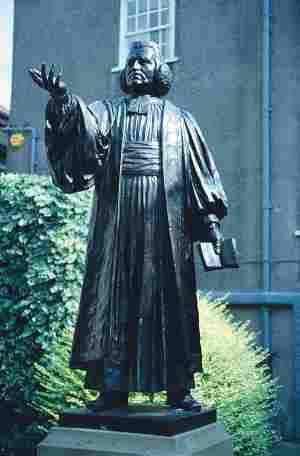 The mission school sent missionaries throughout Scotland, England, Wales, and Europe. Columba and his monks observed the biblical seventh day as the Sabbath. Peter Chanberlen, a Puritan Sabbitarian, and the physician to the royal families of England and Scotland. He was baptised about the year 1648. 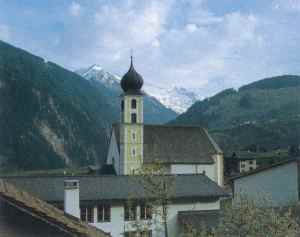 Discentis, a community high in the Alps of southern Switzerland, site of one of many Celtic Sabbatarian schools. 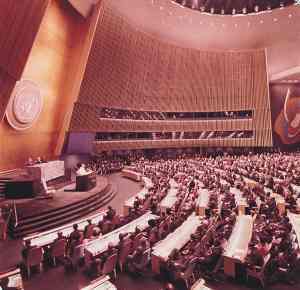 The statesmen of the world gather at the United Nations to be addressed by the Pontiff. 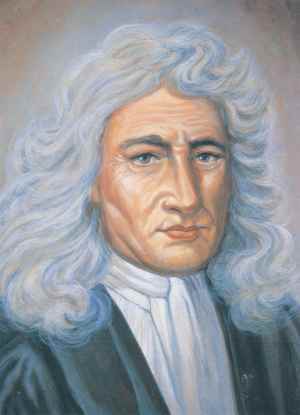 John Wesley: Well renowned English reformer appeals to the people to make the Bible their only creed. The prophecy of Revelation 13 declares that the power represented by the beast with lamblike horns shall cause "the earth and them which dwell therein" to worship the papacy --there symbolized by the beast "like unto a leopard." The beast with two horns is also to say "to them that dwell on the earth, that they should make an image to the beast;" and, furthermore, it is to command all, "both small and great, rich and poor, free and bond," to receive the mark of the beast. Revelation 13:11-16. It has been shown that the United States is the power represented by the beast with lamblike horns, and that this prophecy will be fulfilled when the United States shall enforce Sunday observance, which Rome claims as the special acknowledgment of her supremacy. 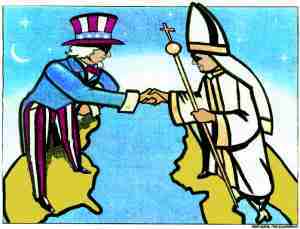 But in this homage to the papacy the United States will not be alone. The influence of Rome in the countries that once acknowledged her dominion is still far from being destroyed. And prophecy foretells a restoration of her power. "I saw one of his heads as it were wounded to death; and his deadly wound was healed: and all the world wondered after the beast." Verse 3. The infliction of the deadly wound points to the downfall of the papacy in 1798. After this, says the prophet, "his deadly wound was healed: and all the world wondered after the beast." Paul states plainly that the "man of sin" will continue until the second advent. 2 Thessalonians 2:3-8. To the very close of time he will carry forward the work of deception. And the revelator declares, also referring to the papacy: "All that dwell upon the earth shall worship him, whose names are not written in the book of life." Revelation 13:8. In both the Old and the New World, the papacy will receive homage in the honor paid to the Sunday institution, that rests solely upon the authority of the Roman Church. Like a great searchlight shining across the centuries, the sure word of prophecy focuses its bright beams upon our day. In this light we see clearly the trend of events. As the call to liberty and freedom is given throughout the world, it is being confronted by the powers of evil and liberty of conscience will be challenged. There is hope -- "light at the end of the tunnel." Keep reading the Bible to discover the final outcome.